Formed in 1974 as The Guildford Stranglers, The Stranglers were at the vanguard of punk and new wave whilst never really being accepted as ‘proper’ punks. Although they looked as hard as nails, they were older than their contemporaries, had keyboards in the band and shock, horror, could play their instruments. However, rock fans everywhere embraced their more melodic, witty and often menacing musical vision and the band have had a string of hit singles and albums. Still going to this day, but without original guitarist Hugh Cornwell, the classic line up is Cornwell, Jean Jacques Burnel, Dave Greenfield and Jett Black. This is the line up covered in this book which goes from the band’s conception to Cornwell’s departure in 1990. 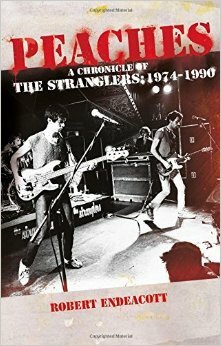 Written by an uber fan who has good connections within The Stranglers community, the book, loosely set out in diary form (Think Punk Rock Diary), covers the band’s stormy history, a history often clouded by darkness. It weaves in secondary research plus enlightening splashes of exclusive quotes and anecdotes together with rare photos and interview extracts. Plus of course, accounts of so many gigs and incidents – this band is never far from controversy.